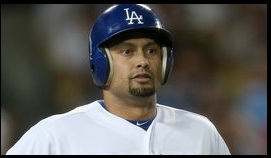 PBR - Free agent outfielder Shane Victorino has agreed to a three-year, $37.5 million contract with the Boston Red Sox. Victorino spent eight seasons in Philadelphia before being sent to the Los Angeles Dodgers in a trade this past July. The 32-year-old is a career .275 hitter with 90 home runs and 409 RBIs but is coming off the worst season of his career. General manager Ruben Amaro Jr. was lukewarm to the idea of bringing Victorino back to Philadelphia, but with Angel Pagan and B.J. Upton off the market it looked as if the Phillies would make a serious play. The Victorino signing leaves Josh Hamilton and Michael Bourn as possible answers via free agency in center field for the Phillies, but neither seems like a perfect match. Sources earlier in the day confirmed the Rangers and Hamilton are inching towards a deal, while the Mariners seem smitten with Bourn. As of now, the Phillies are not the favorites to land either player. ESPN.com's Pedro Gomez reported the Phillies were in discussions with the Diamondbacks about a possible swap involving Cliff Lee and Justin Upton, but Amaro quickly denied the report and said the clubs never spoke. If the Phillies can't strike a deal with Hamilton or Bourn than Amaro will have no choice but to trade for a center fielder. Dexter Fowler of the Rockies and Curtis Granderson of the Yankees are two possible targets. Moving forward, Amaro knows things will only get tougher. "When these guys go off the board, the domino effect of that is a player available in a trade, his value goes up," Amaro said. "Now teams want an extra player or a stronger package. Money can affect some of the things in trades, too. That may delay some things. Teams who are willing to move a quality player, their asking price is high right now. We have to wait for it to come down."